The Goddess represents the feminine, nurturing side of Deity -intuitive, creative, and magical. She is the inner nature of Deity -the origin of the external Universe. Thus the Goddess is the Creator, the Source - the God emerges from Her, when She sets the Universe into motion. The God is the Goddess’ Divine Child, formed from Her inner nature, Her “Other Self” as the Vangelo delle Streghe puts it. The God is also the Divine Consort, Whose union with the Goddess describes existence as we know it. In this sense the Goddess and the God are the polar forces also termed Yin and Yang. Yin, the Feminine, spiritual, emotive aspect of Deity which is within all things and Whose presence gives all things life. Yang the Masculine, physical, volatile aspect of Deity which manifests in motion and action and Whose permutations build up the outer form of things. In Wicca the Goddess is primarily revered through Her form as the Triple Goddess. As the God is often represented by the Sun, the Goddess is often represented by the Moon, and its three phases are taken as instructive as to the nature of Her being; the Waxing Moon representing creation and inspiration, embodied in the Maiden Goddess. The Full Moon representing fruition and sustenance, embodied in the Mother Goddess. And the Waning Moon representing fulfillment and endings, embodied in the Crone Goddess. The Maiden is the Young Goddess of Spring and new beginnings. She is the Goddess of the Dawn, of youthfulness, anticipation of life and fresh potential. The Maiden is the Goddess of art, creativity and self expression -of beauty, intelligence, and skill. The Maiden is manifest in action and self confidence, exploration and discovery. She is sometimes called the Virgin. The term virgin in this instance does not mean physical virginity, it means that the young Goddess is independent - She is responsible for Her own actions, She knows who She is and does not answer to anyone but Herself. The Maiden is aware of Her sexuality and can either hold it at bay or abandon Herself to it. As the Huntress and Mistress of the Woodlands, She is both a friend and companion to all young creatures and a skilled hunter. She is the armed keeper of the Universal Laws of Balance and can mete out punishment swiftly and dispassionately if needed. You may experience the Goddess in Her form as Maiden when you look upon a new born child, or experience a beautiful sunset. She is the continuation of all life, gifting us with the ability to find delight in the simple pleasures of the world – a butterfly in summer, sunlight on water, the stillness of a forest – all are within the realm of the Maiden Goddess. The Maiden’s magick is strongly connected to Nature and natural magick; She can inspire you with new ideas or lead you along a path that is new to you. She can give you a fresh new way to look at something. The Maiden may make Her presence known to you mentally without warning when you least expect it. She shows us the way to spiritual centeredness, running ahead of us enticing us to follow Her down the path that we fear the most - the way that leads us through the labyrinth of our minds into our own sub- consciousness. The Waxing Moon is the Maiden's Moon. Her colours are white and pink symbolic of innocence and newness. The Maiden loves wild flowers specially white ones. The Maiden's animals are all wild animals, specially the Owl and the Deer. Artemis - (Greek) eternal Virgin Goddess, Lady of the forests and hunting, and also of birth. Blodewedd - (Celtic) This Spring Goddess was created by magic from nine spring flowers to be the wife of Llew Llaw. This got around the curse Arianhod had placed upon her son preventing him from taking a human wife. Brigid - (Celtic) In her maiden aspect this Goddess is honored at the festival of Imbolc which celebrates the first stirrings of Spring. Chalchihuitlicue - Wife of Tlaloc, the God of Rains for the Aztec, was called the Precious Jeweled Lady, and had in her aspects associated with the Maiden like flowers, spring and the beauty of youth. Diana - (Roman) Goddess of the Crescent Moon and the Hunt. She is the virgin Goddess of childbirth and women. Oak groves are sacred to Diana. Flora - (Roman) The Goddess of flowering plants, especially those that bore fruit. Her festival, the Floralia, took place in April or early May and was marked with dancing, drinking, and flowers. Freya - (Nordic) This Nordic fertility Goddess is linked with spring growth and flowers. Hebe - (Greek) The Goddess of eternal youth and Spring. Kore - (Greek) Kore is an alternative name for the Greek Goddess Persephone. Ostara - (Celtic) Painted eggs and white rabbits are sacred to Ostara ,the Celtic Goddess of Spring, fertility and rebirth. Her symbols haves been incorporated into the Christian celebration of Easter. Ninniane - Also called Nimue, in the Arthurian myth. She was Merlin's protege and was courted by him. Nimue locked Merlin in a cave to ward off his constant advances. Parvati - (Hindu) Maiden of affirmations and love, She became Shiva's, the Lord of Destruction, mate. Persephone or Proserpina - Persephone means maiden. She was the daughter of Demeter, who was kidnapped by Hades and reigns with him in the Underworld, for the dark half of the year. Spring arrives when Persephone leaves Hades and joins her Mother. Rhiannon - (Celtic) Maiden who is the "Divine Queen of the Faeries". She is a Goddess of movement and change, who remains steadfast and comforting in times of crisis and loss. The Mother aspect of the Triple Goddess is perhaps the easiest for humans to understand and identify with. The image of the physical mother caring for, nurturing, protecting and loving her children is easily translated to the Mother Goddess. She is associated with confident adulthood and parenthood, She is summertime and the ripening of crops, She is procreation of all things earthly and universal, She is the highest point of all cycles and the sustainer of the Universe. She is the fullness of life, She turns the Wheel of all the seasons, and is the repository of all knowledge. She is the Earth Mother and the Sky Mother who walks beside us into the Labyrinth of Mysteries.The Universe is Her child and She loves and cares for it, providing it with inexhaustible resources from within Herself, even as a mother nurses Her infant from the milk of her breasts. Her color is red, the color of blood and the life-force that courses through us all. Her season is summer and Her Moon is Full. Her symbol is the Cauldron, the churning pot of re-generation. The Mother Goddess rules the Sabbats of Beltane, Litha and Lammas. She shares Winter Solstice with the Maiden and the Crone. The Mother Goddess teaches us to accept responsibility and to understand the consequences of our own actions. She will guide us towards self-discipline and patience, so that we may grow spiritually into balanced adulthood. She teaches us to reach out to others with loving energy, and to spiral into our Divine center to both give and receive love. All acts of love are Her rituals. She does not want us to live lives filled with deprivation or chained to addictions, excesses or and other form of self- harm. The Mother Goddess actively works magick to bring us into harmony, happiness and freedom. Just like a human Mother, she wants the very best for us and will help us. All we need to do is reach out to Her. The Mother Goddess nurtures all creation and is filled with love for all, yet, like a real mother She will not hesitate to mete out discipline when necessary. Work against Her laws of Universal balance, portray yourself as one who has all the answers or is spiritually enlightened without having done the background work of self-discipline, self- understanding, and responsibility, and She will bring you back to reality! Mother Goddess magick is most powerful at the Full Moon. Call upon Her for spells involving fruition, protection, healing, protection, guidance, marriage or life partners, gardening, animals, choices, peace, psychic direction and spiritual awakening. Artemis (Greek) Despite being a virgin goddess she also presides over childbirth due to the ease of her own birth. Danu The mythic Mother Goddess of the Tuatha Dé Danann, the Celtic tribes that first invaded Ireland. Frigg (Nordic) Frigg was the Odin wife she protected a man's marriage and made him fertile. Her name was invoked to bring children into a conjugal union. Hathor (Egyptian) Mistress of the West, who welcomed the dead into the next life. Sky-goddess of love,music, dance, foreign lands and fertility who helped women in childbirth, as well as the patron goddess of miners. Hathor is often depicted wearing a headdress made of a pair of cow horns with a sun disk. Hera (Greek) Goddess of women and marriage. Sacred to her are the peacock and the cow. Juno (Roman) Often called upon by infertile women. Macha (Irish) Fertility goddess who primarily concerned with male virility. Nile Goddess - One of the prehistoric fertility Goddesses worshipped in the Nile Delta. She had the head of a bird. Venus (Roman) Roman equivalent to Aphrodite. She represented one of the main fertility Goddesses. The Crone represents the Goddess in Her aspect as Elder. The Crone is the Wise Woman, the Witch, the Matriarch. The Crone is the Goddess of Death, and magic, and the Spirit realm. She is the Goddess of Wisdom, visions, and guidance. Hers is the height of spiritual power, for She is the Great Sorceress Who creates Her will through magic. Goddess of Transformation, the Crone is the Destroyer Who dissolves outmoded forms, allowing new growth to occur. The Crone Goddess aspect of the Triple Goddess may be the least understood and feared of the three aspects. The Crone deals with the end of cycles and death; She has been called the Terrible Mother, the Dark Mother, the Hag and the Wise One. She is the gateway to death and re-birth, Her wise council teaches us spiritual completion, and the deepest of all mysteries - that without death there is no re-birth. Her cauldron awaits each of us, “All things living are mine own, from me they come, to me they go.” The Crone Goddess is winter, night, outer space, the abyss, menopause, and the advancement of age. She is the natural end to all cycles. Her color is black, the absorber of all light, and the color of darkness where all life rests before re-birth. Her season is winter and Her Moon is the Waning Moon. Her symbols are Lantern of truth and wisdom which She uses to guide us, and the Key which is symbolic of unlocking the deep mysteries. The Crone Goddess rules the Sabbat of Samhain. She shares Winter Solstice with the Maiden and the Crone. Crone Goddess magick is most powerful at the Dark Moon. Call upon Her for spells involving harvesting, resting, past life meditations and path working, endings, aging, divorce, rest, retribution, death, protection from physical or psychic attacks, trance work to communicate with the Spirit world. Annis (Celtic) : A frightening old woman, keeper of wisdom and old ways. Badb: (Irish) A shape shifting warrior Goddess who symbolizes the cycles of life and death, wisdom and inspiration. Baba Yaga (Russian) : In Slavic mythology she is the wild old woman; the witch; and mistress of magic. 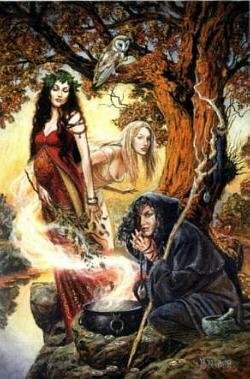 Ceridwen (Celtic) : The Keeper of the Cauldron. Cailleach (Celtic): The hag and destroyer Goddess who ruled over disease, death, wisdom, seasonal rites and weather magic. Elli (Nordic) : Goddess of old age, she defeated Thor. Grandmother Spiderwoman (Native American) : An old wise woman who gave man the sun and fire. Kali (Indian) : Goddess of destruction and rebirth. Kalma (Finnish) : Underworld Goddess of death and decay. Libitina (Roman): Goddess of funerals and pyres. Lilith (Hebrew) : Adams first wife and guardian of women's mysteries. Macha (Irish): The wild woman who battles against injustice to woman and children. Mórrígan (Celtic): Crow Goddess who understands the nature of death. Nicneven (Celtic): Goddess of Magic and winter. Nephthys (Egyptian): A funerary Goddess associated with death, magic and reincarnation. XochiQuetzal (Mexican): Goddess of the cycles of life celebrated on the Day Of the Dead.